Hiring? 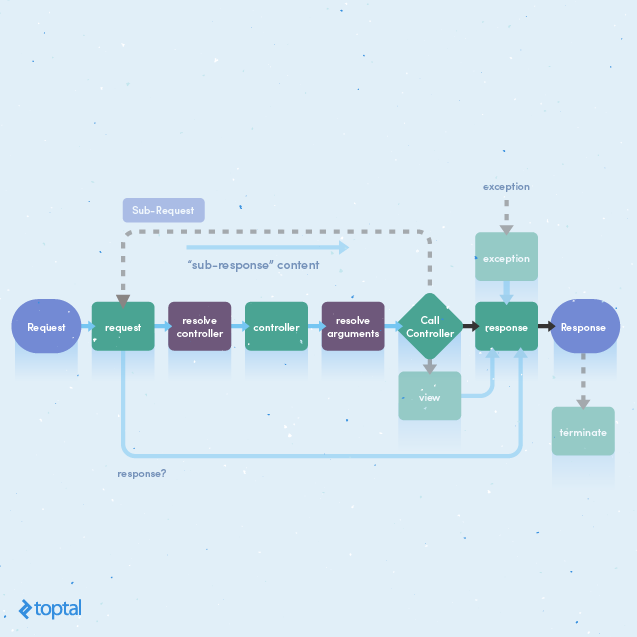 Toptal handpicks top Symfony developers to suit your needs. Vasilii has worked as a web architect and PHP back-end developer, specializing in NIX administration, and high-load, large scale projects. Symfony2, a high performance PHP framework, uses Dependency Injection Container pattern where components provide a dependency injection interface for the DI-container. This allows each component to not care about other dependencies. The ‘Kernel’ class initializes the DI-container and injects it into different components. But this means DI-container can be used as a Service Locator. Symfony2 even has the ‘ContainerAware’ class for that. Many hold the opinion that Service Locator is an anti-pattern in Symfony2. Personally, I do not agree. It is a simpler pattern compared to DI and it is good for simple projects. But the Service Locator pattern and the DI-container pattern combined in single project is definitely an anti-pattern. In this article we will try to build a Symfony2 application without implementing Service Locator pattern. We will follow one simple rule: only DI-container builder can know about DI-container. Let’s create our base application structure. While we are at it, we will install Symfony DI-container component. And let’s create our container builder and forbid container injections. Here we use the Config and the Yaml symfony components. You can find details in official documentation here. Also we defined the root path parameter ‘app_root’ just in case. The get method overloads the parent class’ default get behavior and prevents the container from returning the “service_container”. Next, we need an entry point for the application. This one is meant to handle http requests. We can have more entry points for console commands, cron tasks and more. Each entry point is supposed to get certain services and should know about the DI-container structure. This is the only place where we can request services from the container. From this moment we will try to build this application only using DI-container configuration files. HttpKernel uses HttpFoundation component for Request and Response objects and EventDispatcher component for event system. There are no problems in initializing them with DI-container configuration files. 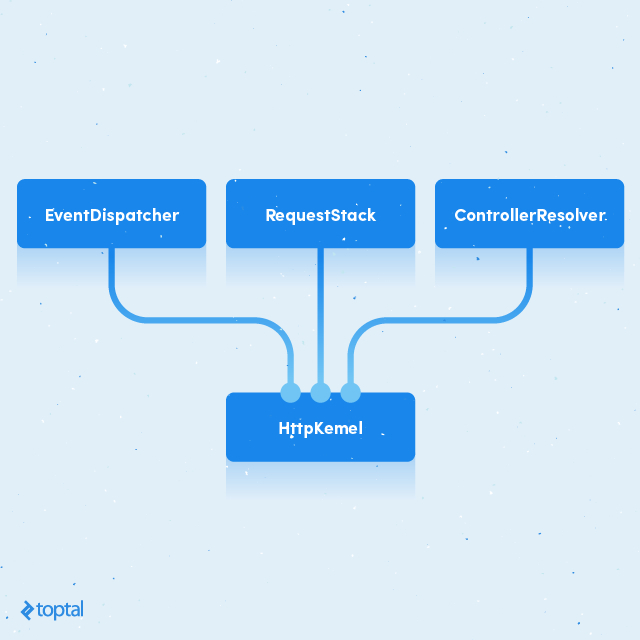 HttpKernel has to be initialized with EventDispatcher, ControllerResolver, and optionally with RequestStack (for sub-requests) services. As you can see, we use the ‘factory’ property to create the request service. HttpKernel service only gets Request object and returns Response object. It can be done in the front controller. Or the response can be defined as a service in the config by using the ‘factory’ property. And then we just get it in the front controller. 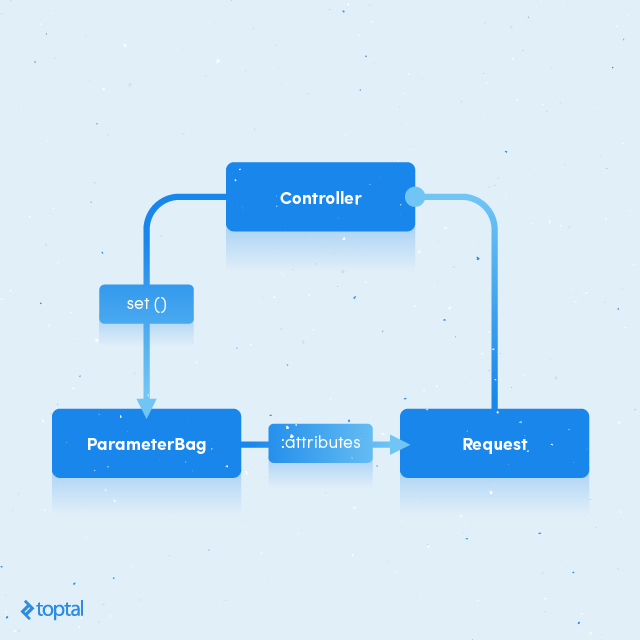 The controller resolver service gets ‘_controller’ property from attributes of the Request service to resolve controller. These attributes can be defined in container config, but it looks a bit more tricky because we have to use a ParameterBag object instead of a simple array. And here is the DefaultController class with defaultAction method. With all of these in place, we should have a working application. Now the controller has access to the request service. As you can see, this scheme has circular dependencies. It works because the DI-container shares service after creation and before method and property injections. So when the controller service is creating, the request service already exists. But this works only because the request service is created first. 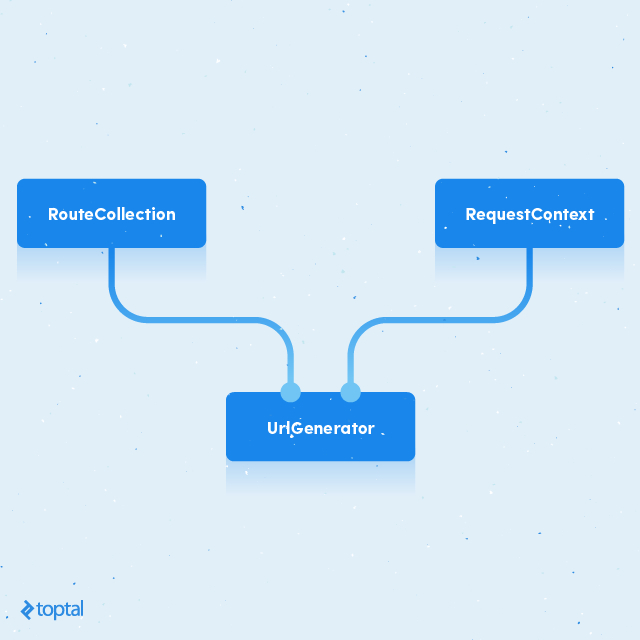 When we get response service in the front controller, the request service is the first initialized dependency. If we try to get the controller service first, it will cause a circular dependency error. It can be fixed by using method or property injections. But there is another problem. DI-container will initialize each controller with dependencies. So it will initialize all existed services even if they are not needed. Fortunately, the container has lazy loading functionality. Symfony DI-component uses ‘ocramius/proxy-manager’ for proxy classes. We have to install a bridge between them. Now we can define lazy services. So controllers will cause initialization of depended services only when an actual method is called. Also, it avoids circular dependency error because a controller service will be shared before actual initialization; although we still have to avoid circular references. In this case we should not inject the controller service in the request service or the request service into the controller service. Obviously we need a request service in controllers, so let’s avoid an injection in the request service on the container initiation stage. HttpKernel has events system for this purpose. Apparently we want to have different controllers for different requests. So we need a routing system. Let’s install the symfony routing component. The routing component has class Router which can use routing configuration files. But these configurations are just key-value parameters for the Route class. Symfony framework uses its own controller resolver from the FrameworkBundle which injects container in controllers with the ‘ContainerAware’ interface. This is exactly what we are trying to avoid. HttpKernel controller resolver returns class object as is if it already exists in the ‘_controller’ attribute as array with controller object and action method string (actually, the controller resolver will return it as is if it is just an array). So we have to define each route as a service and inject a controller in it. Let’s add some other controller service to see how it works. URL generator can be injected into controller and rendering services. Now we have a base application. Any other service can be defined in the same way the configuration file is injected into certain controllers or event dispatcher. For example, here are some configurations for Twig and Doctrine. Twig is the default template engine in Symfony2 framework. Many Symfony2 components can use it without any adapters. So it’s an obvious choice for our application. Doctrine is an ORM used in Symfony2 framework. We can use any other ORM, but Symfony2 components already can use many Docrine features. We can also use YML and XML mapping configuration files instead of annotations. We just need to use ‘createYAMLMetadataConfiguration’ and ‘createXMLMetadataConfiguration’ methods and set path to a folder with these config files. There are many other useful Symfony components like Form, Command, and Assets. They were developed as independent components so their integration using DI-container should not be a problem. DI-container also has a tags system. Tags can be processed by Compiler Pass classes. The Event Dispatcher component has its own Compiler Pass to simplify event listener subscription, but it uses ContainerAwareEventDispatcher class instead of EventDispatcher class. So we can’t use it. But we can implement our own compiler passes for events, routes, security and any other purpose. For example, let’s implement tags for the routing system. Now to define a route we have to define a route service in a route config file in the config/routes folder and then add it to the route collection service in the config/routing.yml file. It looks inconsistent because we define router parameters in one place and a router name in another. With tag system, we can just define a route name in a tag and add this route service to the route collection using a tag name. The DI-container component uses compiler pass classes to make any modification to a container configuration before actual initialisation. So let’s implement our compiler pass class for the router tag system. As you can see, we get route collections by the tag name instead of service name, so our route tag system doesn’t depend on the actual configuration. Also, routes can be added to any collection service with an ‘add’ method. Compiler passers can significantly simplify dependencies’ configurations. But they can add an unexpected behavior to the DI-container, so it’s better to not modify existed logic like changing arguments, method calls, or class names. Just add a new one over existed as we did by using tags. We now have an application that uses only DI container pattern, and it is built using only DI-container configuration files. As you can see, there are no serious challenges in building a Symfony application this way. And you can simply visualize all your application dependencies. The only reason why people use DI-container as a service locator is that a service locator concept is easier to understand. And a huge code base with DI-container used as a service locator is probably a consequence of that reason. You can find the source code of this application on GitHub. This is so much awesome as I expected! Thanks for sharing! 1. Request should never be a dependency as it's not a service by nature but is rather an object to be processed by services/controllers (and this is fixed in Symfony since 2.1, as far as I remember), using RequestStack to retrieve request in controllers is okay though. The same applies for Response. 2. In fact, you already have some predefined dependencies in WebController - Request, EntityManager, Templating\EngineInterface and UrlGenerator. Some of them are not actually needed for specific controllers. You'll finally end up adding every possible dependency to WebController. Then you'll realize that it's more obvious to wrap them in some container. 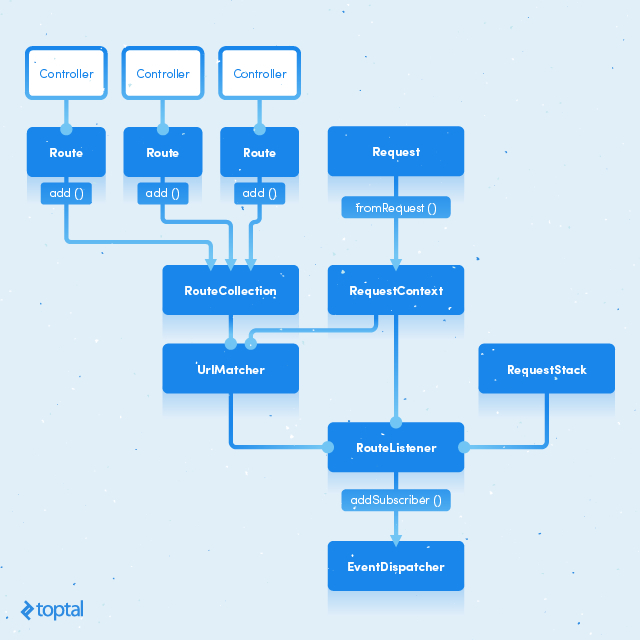 First it will be something like ControllerDependenciesContainer then you'll realize that you never know what will be needed in abstract controller and you'll just push the whole DIContainer to your Controllers and will end up with ServiceLocator. So, for the pure scientific experiment there is no need to have any dependencies in abstract controller. Better to define them properly for each particular concrete controller class. Also, looking at your default WebController dependencies I can see that you're mixing up controllers and actual services with specific dependencies. Proper request processing logic is: request -> dispatcher (front controller) -> controllers layer -> back end (properly defined services with specific dependencies) In your logic it's: request -> dispatcher (front controller + controllers layer) -> back end (properly defined services with specific dependencies which you're calling controllers) So, you just moved controller logic with the whole DIContainer (ServiceLocator) to dispatcher layer and substituted naming. What's super bad in this logic is that all your back end services (you're calling them controllers) are extended from some abstract service WebController which has some dependencies by default. This leads to unneeded predictions. Finally, if someone wants something slim instead of a full-stack Symfony2, it's worth it to try Silex which will provide you more simple DI container and more slim controller layer. P.S. I knew one guy who tended to define controllers as services and didn't want to get rid of this practice. We've decided to say him "bye-bye". We're using a full-stack Symfony 2.7 though so it's obviously too overengineered way to work with its controllers layer. 1. This is a recommendation for the Symfony framework. Here request injected in a controller just for example. 2. The part about abstract controller just demonstrates how to reorganize controller injections. If you don't need all dependencies from the WebController you obviously should not inherit your controller from it. 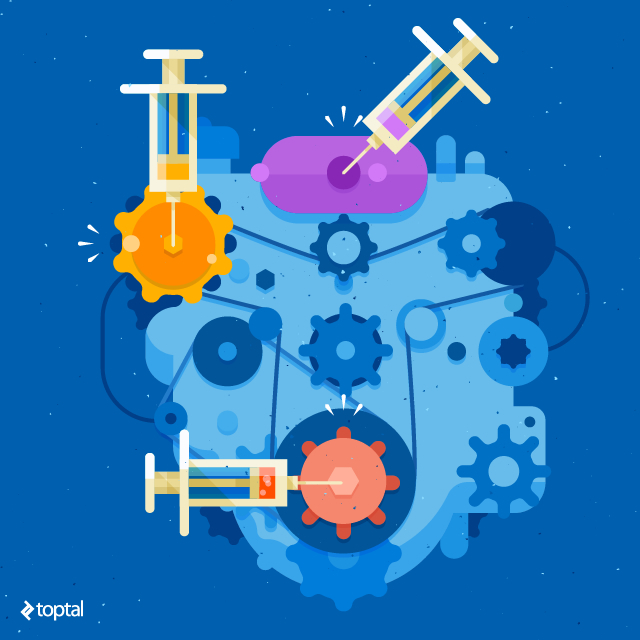 Dependency Injection is an amazing feature which is offered by Symfony 2. Kudos for this article! 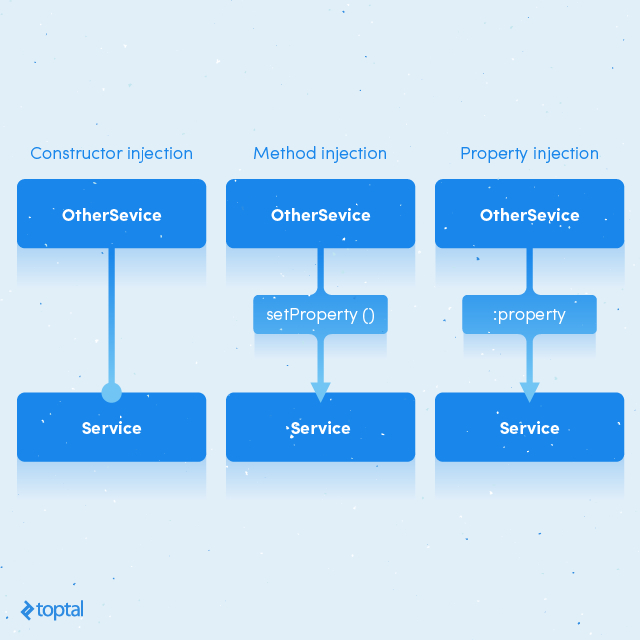 "Controller injection" should be called as "Constructor injection"
Indeed, I have read several articles on Dependency Injection, but this one was particularly useful, since it explains the concept from a practical perspective – with coding, screenshots, and all. I’m sure your effort will help many people. Particularly liked how you have explained the way to create the application, and given examples of injecting a service into certain controllers. Thanks for the article. One thing author had been forgotten was to write about removing the line <pre><code> calls: - [ set, [ _controller, ["@controller.default", defaultAction ]]] </code></pre> in <strong>kernel.yml</strong> after routing was enabled. Great post, thanks for sharing! The only issue I find is that preventing the service_container injection doesn't allow you to define decorators for it. Any thoughts about it?